On Sunday, February 3rd 2013, the BBC One weekly debate programme ‘The Big Questions’ asked “Is criticising Israel anti-Semitic?”. Those in the UK can watch the programme on BBC iPlayer for a limited period of time whilst those elsewhere can see a video of the relevant portion of the programme at the bottom of this article. Beyond noting the sterling contributions of Rabbi Yitzchak Schochet ,Tom Wilson of ‘Stand for Peace‘ and the young man in the beige sweater, I am going to leave commentary on the programme itself to you, the reader, in the comments below. 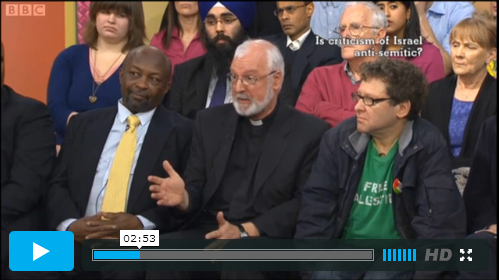 The anti-Zionist Palestine Solidarity Campaign founder Tony Greenstein (front row, right) was permitted to take part in this programme whilst wearing a ‘Free Palestine’ T shirt with a clearly visible slogan and a Palestine Solidarity Campaign badge. Having participated in this programme myself a few years ago – also alongside Greenstein – I know that the programme’s producers at that time stated very clearly (when Greenstein then tried to get into the studio wearing an over-sized ‘Boycott Israeli Goods’ lapel badge) that clothing, badges or suchlike with a political message were not to be worn by anyone participating in the show. It may be that the BBC’s regulations on that subject have since been relaxed, in which case we can perhaps now anticipate seeing guests on BBC programmes wearing Combat 18 T shirts, EDL scarves, anti-Gay badges or anti-Muslim hats. If that is not the case, then someone on The Big Questions production team has some other big questions to answer, because the promotion of publicity for an organisation which supports and enables a genocide-aspiring, antisemitic terror group responsible for the deaths, injury and maiming of thousands of Israelis (particularly in a discussion which touches on the Holocaust and antisemitism) on licence fee-funded television is clearly way beyond the pale and severely compromises the BBC’s reputation for impartiality. Quite apart from the Angry One, my impression of the program is that, yet again, viewers heard misinformation. Unfortunately, some of it coming from a vicar/priest (couldn’t tell which) and his status lent a stamp of respectability and credibility to his views in a way that I doubt a rabbi could match. There is something about the dog collar (and a nun’s habit for that matter) which implies an other-worldly holiness and wisdom. Such a pity this particular chap was simply regurgitating what he’d heard rather then what he’d taken time to research for himself. I was also surprised by the man who didn’t think Scarfe’s cartoon was antisemitic because it didn’t depict bankers or Jews with stereotypical Jewish noses – i.e. that if a cartoon isn’t in line with 70-odd yr old Nazi propaganda, and therefore screamingly obvious because it’s all been seen before, it cannot be antisemitic. This man clearly doesn’t realise that – as I mentioned in a previous post – antisemitism is like a virus, mutating to match the age in which it is manifesting. The question itself was biased – an unbiased question would be “CAN criticism of Israel be antuisemitic?” The question posed implied that Jews contend that all criticism is antisemitic – almost no-one holds such a view. How typically misleading of the BBC. The tone of voice used by the presenter when introducing the subject was also a little suspect. By the way, a complaint about that Marxist creep Greenstein’s attire will be winging its way to the BBC. I don’t think it does much good to be upset after the fact and then be left trying to explain why something is antisemitic. It’s leaving the Jewish community yet again defending a position. Instead, I think it needs to push for educators to understand that there are gaps: we need a better understanding of history, propaganda, human nature and critical thinking. It’s still possible that the Holocaust is seen as being brought about by a nation particularly disposed to such acts, which in turn may cause complacency and a “It could never happen here” belief. Social psychology has already indicated that we are all capable of atrocious behaviour brought about by situational forces. It really isn’t that difficult to create obedience to authority – wearing a white coat can be enough. Has the BBC ever made a programme debating politics of any other single country, say China, N Korea, US or Pakistan, a country whose terror networks effect the lives (literally) of all of us? BBC/Guardian are unashamedly anti-Israel, pro Hamas Islamists. Plague on both their houses.